I am Shafique, an engineer by chance, a marketer by choice and a writer by passion. Like most of us I too joined engineering college due to lack of options and dearth of career counselling. Therefore, I was unable to explore other career streams. 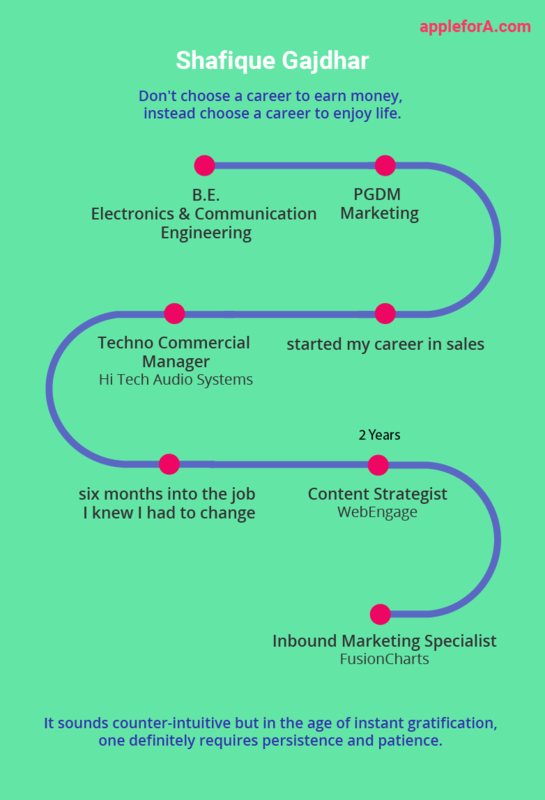 Took various detours since then and now I am working as Inbound Marketing Specialist at FusionCharts, Bangalore. Content Strategist plans, executes, distributes and analyses the performance of all the content that goes out from a business. It may include PR articles, blog, website content, case-study, white paper, ebook, webinar, sales collateral, marketing collateral amongst others. Common misconception limits the role of content strategists as merely writers. What was your ambition during higher secondary school and how did you end up becoming an Inbound Marketer? As a kid I wanted to be a pilot, then a doctor. Later the wishful thinking turned into me wanting to become an engineer. I appeared for engineering entrance exams (MP-PET 2007) and got into an engineering college. I had to choose between IT and electronics, I chose the latter, for it had something to do with mobiles, electronic hardware, and telecommunication. The choice was also logical when looked at from the prudent lens of employment opportunity. An electronics engineer can get into IT firms as well as domain specific companies. The small town engineering college provided limited exposure with respect to co-curricular activities, also limiting my worldview to just passing semester after semester. The world was still recovering from the 2009 recession and a few mass-recruiters turned up for 2010-11 placement season. The placements were predictably dull. Having sensed the dismal state beforehand I planned to do an MBA. With a latent inclination towards the world of branding, marketing became my choice of specialization and thereafter, the preferred career choice. After post graduation, I started my career into Sales with Bose Corporation’s single point distributor in India. I handled sales of Bose’s Professional Audio Products in Mumbai, Indore and Bhopal. The pro-audio products are used for installed sound for places like Pubs, Auditoriums, Places of Worship, etc. Six months into the job I knew I had to change. As luck would have it, I landed myself a job in Content Marketing for a SaaS (Software as a service) based startup in Mumbai. I completed two years there and shifted recently to Bangalore in another SaaS company. As part of marketing team at FusionCharts, I am primarily responsible for all the inbound marketing efforts. This includes content marketing, content distribution, email marketing and demand generation among others. The job involves aligning inbound marketing to the needs of the business, customer personas or stages in the purchase funnel. A typical day at work is a mix of music in background, coffee and macbook. The workplace is in a co-working space that always has some really interesting conversations on offer. What did you learn about this career after you started yours? These are monumentally dynamic times, if you look back, companies that were doing phenomenal business a few years back are now struggling (Nokia, Blackberry). It is the very nature of marketing as profession that one cannot sit on laurels and expect things to work the way they did in past. For marketers, learning never stops. The pace of change demands it and for marketing in tech industry constant learning becomes all the more important. Develop and hone the ability to spot a trend before most people do. Drill down further on the same lines, it is the power of meticulous observation that lets you separate signal from noise. One has to keep in line of all that is trending, learn new stuff, experiment and give room to failure for success to follow. It sounds counter-intuitive but in the age of instant gratification, one definitely requires persistence and patience. I write on Shafiquegajdhar about personal experiences, thoughts, short stories and sometimes poems. Mostly accompanied by a good book during free time. I frequently attempt to make unaffordable vacation – affordable and manage to travel. Marketers equipped with the ability to embrace change in a constantly evolving environment will be in demand in the future. There are a handful of companies that rightly understand and appreciate inbound marketing. Others just do a shabby job in inbound only because it has become popular lately. Bachelor of Engineering in Electronics and Communication, MITM, Ujjain, MP. MBA – Marketing and Operations Management, IMT Nagpur. 2nd Job – Content Strategist @ WebEngage. 3rd Job – Inbound Marketing Specialist @ FusionCharts. If you are given a chance will you still choose Engineering? Why? I will still choose Engineering, because of the lack of alternative career options as well as that taught a lot of other things except the course. Without its grinding, I wouldn’t be here and importantly wouldn’t appreciate it either. MBA did teach me tidbits of management and other things. More than anything else, it taught me a valuable skill – to use common sense. What are the skills required to be a Content Strategist in 2020? What are some alternate career options for a Content Strategist? Roles in Marketing, branding, creative role with ad agencies, etc. Why do you think your current company hired you? Flair for writing, understanding of marketing, and experience with marketing B2B SaaS (software as a service) product landed me the current job. If you have aptitude to peel the layers to arrive at why things are the way they are, marketing is for you. If you’re street smart, you can do really good in startups that unlike MNC’s don’t weigh degrees/certificates more than ability. Any recommended resources students who are interested in Inbound Marketing? Hubspot certification course on inbound. They created Inbound Marketing as category. Read how brands are made, what makes them succeed, why many fail and a handful stand apart? Do internships, even if offsite.